I had this brillant idea the other evening. You see, when I went to the Stampin' Up! regional in San Antonio a few months back we made this cute little note card set. I've been wanting to do it with my stamp club members ever since but with holiday projects and everything else, I haven't been able to fit it in. Well, as soon as I got my Botanical Blooms set on my first Sale-A-Bration order I knew it was perfect for the project. 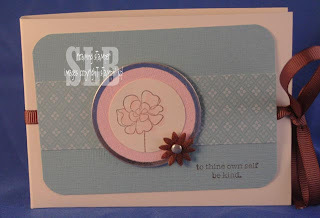 I sat down and was able to do this cute three card scallop note card set in under 30 minutes! My kind of project! I love the simplicity of this project yet, it would be a great set for a teacher, friend, or anyone you need to give a little gift too! I'm so looking foward to my Stamp Club meeting later this month when I can share this project with them! I love this set. It's the perfect size for our punches!